Recently, Microsoft announced the Microsoft Azure Backup Server (MABS). It’s technically a part of Azure Backup offering, but it’s a little different. In fact, it is more like System Center Data Protection Manager (DPM) “lite”. It can protect workloads that are running on Hyper-V, VMware or Physical hardware. It supports all key Microsoft workloads such as SQL, Exchange, SharePoint, Hyper-V as well as infrastructure workloads like IIS, AD and DNS. The data sent to Azure is encrypted before it is sent to the cloud, sent over the wire on HTTPs and stored encrypted in Azure Backup Vault. Microsoft Azure Backup Server itself is free, and you only pay for the storage consumed in Azure Storage. It also includes the license for SQL Server to run the service. Let’s start with download and installation to see the “DPMness”. 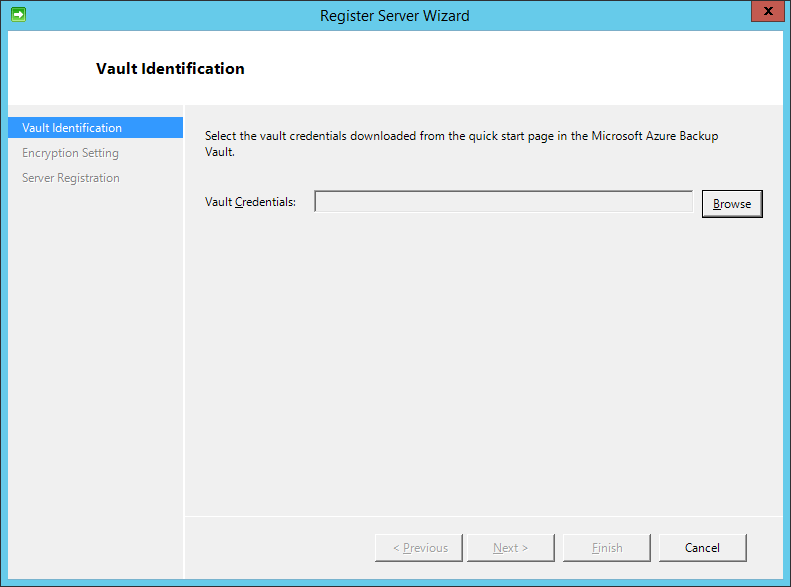 You first need to have an Azure Backup Vault created. Once that is created, navigate to the Quick Start screen. Here you will see a new entry under Protect On-premises workloads > 1. 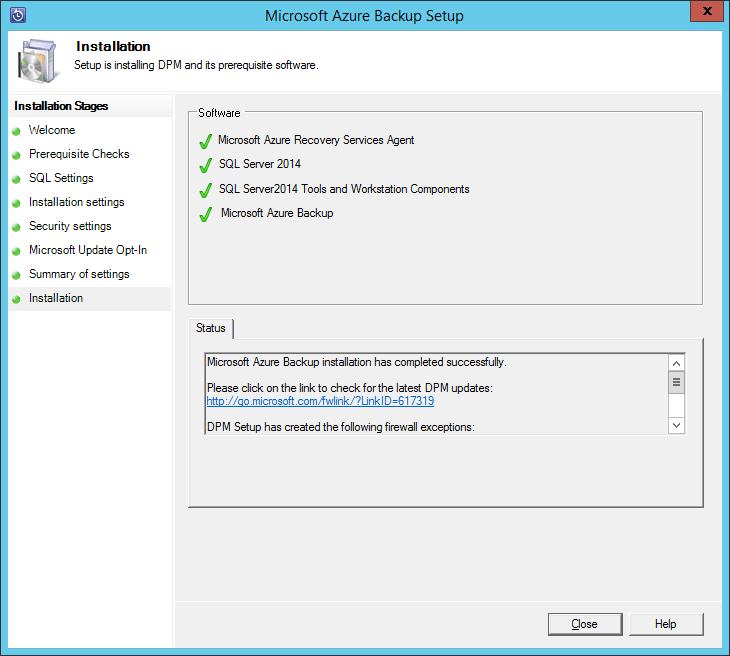 Install Microsoft Azure Backup Agent and register your server, labelled “Microsoft Azure Backup Server for Applications”. When you click on the download link, it takes you to the Microsoft Azure Backup download page. Download all of the .BIN files and the .EXE. After the download is complete, run the MicrosoftAzureBackupInstaller.exe to complete the file extraction. After the extraction is complete, run the Setup.exe. Notice that the splash screen looks similar to the DPM splash screen! It even has “DPM Protection Agent” and “DPM Remote Administration”. 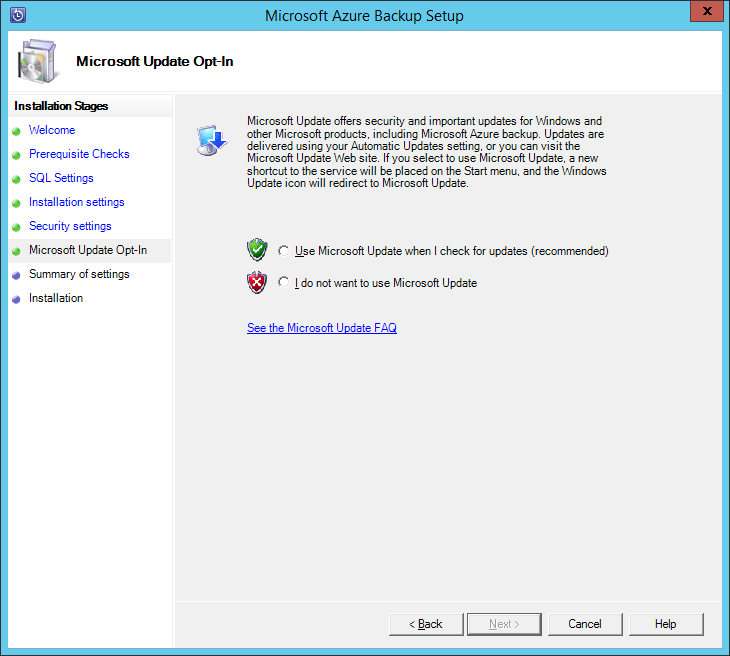 Click the “Microsoft Azure Backup” link to start the installation. On the Prerequisite Checks screen, click the Check button. As long as the check passes, you can continue. On the SQL Settings screen, choose the appropriate option and click the Check and Install button. On the Installation Settings screen, specify the installation locations to use. On the Security Settings screen, enter a password. On the Microsoft Update Opt-In screen, make your appropriate selection. On the Summary screen, review the information. 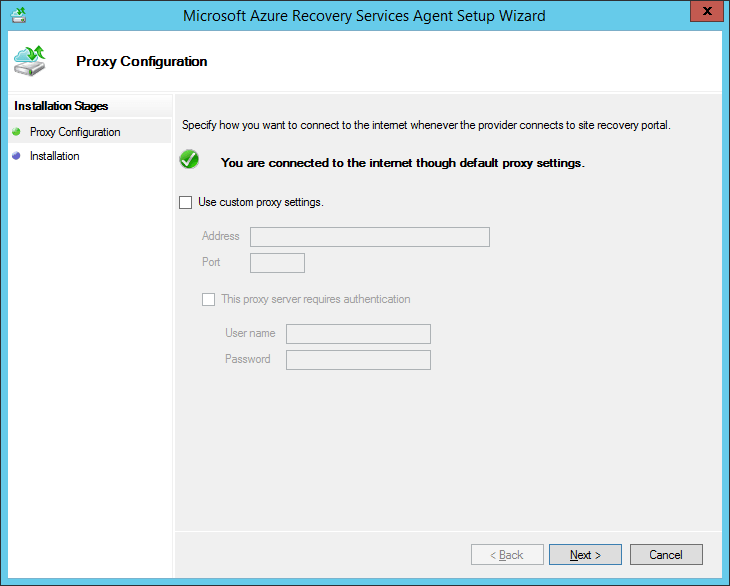 During the installation, the Azure Recovery Services Agent will also be installed. On the Installation screen, click Install. The installation will continue, with connecting to your Azure Backup Vault. Create an Encryption Passphrase. .
Once the installation is complete, you’ll notice that it references DPM. You’ll also notice that the desktop icons, although they say “Microsoft Azure Backup Server” actually look like the DPM icons. And when you launch the Microsoft Azure Backup console, it looks a lot like the DPM console. 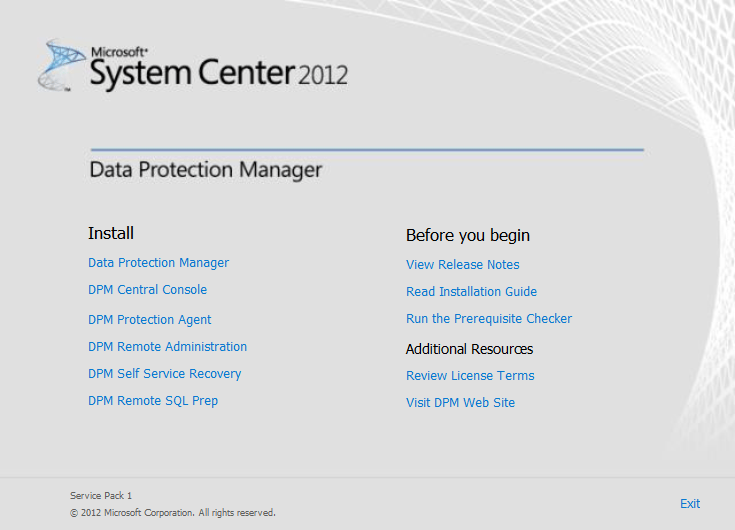 You can compare this with the installation and configuration of DPM, in my SCDPM 2012 SP1 Install & Config Guides. Since MABS is built on DPM code, the interface is almost identical. The only things that you will not see in MABS is any reference to Tape Libraries. It works just like DPM, and can even be used in a standalone “offline” manner, where you can use MABS exclusively for local disk backup. It costs the same in terms of instance pricing, but you will not be charged for storage as you are not using Azure for the offsite backup copy. So, MABS is great for the Small-Medium Business (SMB) environment, where it may be difficult to deploy the bigger brother Data Protection Manager.